The above photo was taken during a high school dance / "Battle of the Bands" in Seattle. I believe it was at the Armory. This shows Dean Tonkin on the bass, Joel Goodman on the drums, "Pete" Ron Peterson on guitar, and Chuck Schoning on keys. Chuck would change from accordion to organ as the mood called. This same night we made our change into our new costume of "White Overhauls"....what a kick that was !!!! My name is Dean Tonkin. I was an "original" member of the Frantics... Ron Petersen, guitar; Joel Goodman, drums; Chuck Schoning, c-melody sax and accordion; Gary Gerke, piano; and me, bass mandolin. Gerke left and we became the Four Frantics. I later got a Kay bass and then a Fender. 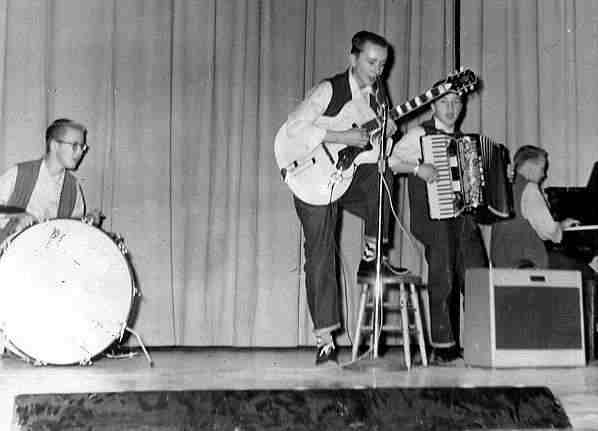 The year was 1953 and I was with the band until 1957. Ron, Chuck, and I also performed as the Three Sons playing ballads and jazz. When I left, Jim Manolides joined as sax and bass. We used to all pile ourselves and our instruments into Joel Goodman's Pontiac convertible and head for gigs as far away as Spokane. We played Parker's, The Eagles, Trianon Ballroom (once with Hank Ballard and The Midnighters), the Palomar, Spanish Castle, and at the old opera house with the traveling show "Jazz at the Philharmonic" with Stan Getz, Gene Krupa, Ray Brown and other legends of that time. Since we were non-union, we auditioned for the Ted Mack Amateur Hour one time but lost out to The Dave Lewis Combo (which was eventually disqualified because they were a union band). After college, Ron became a school teacher. Chuck went to Haight Ashbury and I think Joel went into Real Estate. Ron lives in Arizona and he and his wife, Penny, still plays the lounge circuit when he isn't teaching and playing in the local symphony orchestra. Over the years, I have been on the creative side of advertising and marketing and have written, produced, and directed commercial music with such artists as Ray Charles, Stevie Wonder, Jose Feliciano, Larry Carlton, El Chicano, Blood Sweat and Tears, Rojay North, Gloria Jones, Red Rhodes, Hal Blaine, and more. Pete had been performing at school talent shows since grade school - Broadway Elementary. I was a drummer in the Jane Addams band/orchestra. The idea of a band came out of the movie "Blackboard Jungle" and the theme music by Bill Haley, "Rock around the Clock". That was our first cover tune. Later, we used to sing "Work with my Annie" and "Annie Had a Baby" at school assemblies and thought we were very hip because we knew what they meant. Before I had my own drums I had to use the school drum sets - I don't think we had foot pedals for the bass drum at school so there was no bass drum for those performances. I used to use a straight-back chair for a drum stand before my Dad helped me buy a bass drum, tom-tom and snare drum (with a stand) at a hock shop in 1954.. The rest is history - ancient history. I was the second drummer (1954-58) with the Frantics. I'm Joel Goodman. I think that I was asked to join the Frantics because I had a full set of drums and a car that could carry everyone and everything all at once. The practice sessions were held in my families "rec room" with all the doors wide open. I remember my dad being very proud of our music and the guys in the band. We had a small organ that my dad turned over to Chuck to give us a little fuller sound. We then bought a "Family Car" from one of the funeral homes and it was our mode of transportation for all of us and the instruments for awhile. I remember getting all of the different outfits like the Plaid jackets and the white "Overhauls". I had a heck of a time getting the same type of shoe as I was a 13-14 and everyone else was a 8-9. I tried singing once but was asked not to try again. We made our first recording in a basement recording studio in West Seattle. We were introduced to the "Fleetwoods" there and we made their first cut of "Come Softly To Me" at that time (they then went to California for the recording that we all know and love). Bob Hosko joined us after we heard him doing solo's "jamming" in the lunch room at Lincoln High School and this brought a "raunchy" sound to our music. As Joe Valentine says...."The rest is history - ancient history... but what a good time and all of the memories for all of us.